I needed to save my device’s clipboard to a PDF and PDF Converter not only was the only app that I found that could do this. And it actually worked and produced a usable PDF file. 5-stars just for that, if nothing else. I’m still to explore it’s other features but as far as I’m concerned it already paid for itself! When it actually completes the conversion it seems to do ok, but most of the time it seems like it gets stuck somewhere on the sites I visit. Either it quits completely, gives me a login screen, or only converts half of the page. On occasions when it gets stuck behind a password, the Apple PDF converted works fine. It is also not clear to me why Readdle has so many different apps for converting Things to pdf. They all seem to have the same problem I described in the first paragraph. Just roll this pdf converter in to the printing app, or the pdf app, and call it good. I own copies of all the Readdle software and pdf conversion is the only one I find does not fulfill its promise. Very quick and easy to “convert to PDF” and then “go to file.” But, sometimes the file is in landscape instead of portrait, and here is no rotate feature. Then you have to export to something else and rotate it. Looks like it would be a simple feature to add and one that would be very useful. Using this app for a long time for my research. Works effectively, helps to collect amount of information. Works flawless with tho other apps. I use this all the time!! So far ... so good!!! Works well converting copied/ clipboard/ screenshots to PDF. Very handy. Pretty disappointed. Haven’t used this app extensively, but tried to use it today. I had photo—a screen shot that someone took of an event with event info. I thought, “Hey I have a pdf converter. I’ll save it as a pdf.” The converter just saved the image as an image and converted nothing to text that I could grab to make into an appointment. Pretty worthless really. I might as well have left it as a photo. The interface is unusually well thought out, clear, good-sense. But the app has a long-standing problem: it lacks power. Approximately half the time, a failure notice comes up saying “File too large.” Needs a power boost, you guys. I wouldn’t mind paying a few bucks for a beefed up PDF app. I love this app and recommend it! This works really well. I use PDF expert and sometimes I have to convert Word docs to PDF to edit them. This is the one. Works great for what I need it for. I often take pictures of documents and then email them as PDFs and I have had no issues with it at all. I can access the PDFs for my email very easily too. I work in real estate management and work with contracts, invoicing and ledgers constantly. I found the Readdle suite of apps and use all of them several times a week. They are perfect for my file management requirements especially the PDF converter and scanner app. Good job on these apps guys. Well done. All of the apps in the bundle are easy to use and can be done on the go. It has made my life much easier! I operate using multiple IOS devices and an older iMac. Most of the people. whom I send data to use Windows. I can open up any 1Password protected account file on Safari, click on the export icon (the box and arrow) at the bottom of the page and attach it to an email or text message. And I can easily rename the PDF, make a copy (in Word, for example) and file it in the convenient folder on my device or in the cloud. Love how easy it is to convert multiple photos into a single PDF & rename the file. Doesn’t permit upload to my Cloud so I have to save to docs or PDF software then upload. Otherwise love this. I use this app daily as I browse favorite topics and find articles and web pages I want to copy to read later. It works flawlessly on my iPad Pro 2017. Highly recommend it if you want to capture pages and articles for your files. I have majorly of the apps by this developer. And all exceptionally reliable, I consistently use, and for a couple years now. Good job guys. You have outstanding knowledge and focus on what essentially matters for customers. Now, can you please stop so actively asking for feedback? I promise I will speak up if something is not right. Great app....very easy to use. Ok love the concept of being able to convert images, web pages, etc. to pdf, but the problem is that I feel like this app is a bit dated. For an example, it turns my images sideways for some reason, and I’m unable to select more than one item, because I want to put more images into the same pdf document, but it won’t let me. If the developer is unable to fix this, then I want a refund. This a is great, simple PDF converter. I use it mostly to create PDFs of web pages with long text. I like the ease of renaming the PDF. Sometimes a website's coding creates problems with conversion, which is annoying but not unexpected. I've used other web to PDF converter apps, but they were abandoned by their devs and eventually stopped working. This app is remains a reliable and useful tool. I love the matchless beauty and functionality of this app. It's unusually well thought out, with a clear, good-sense interface. Excellent tool. Teach a person to fish. My review might be a bit biased because I use several of their products. Each one is very good at what it is intended to do. This app is no different. It is easy to use the SHARE SHEET to get access to convert emails and other documents to PDF before filing, forwarding or emailing the file. It integrates well with the DOCUMENTS5 app(which I also really like). Nothin but praise for these folks! 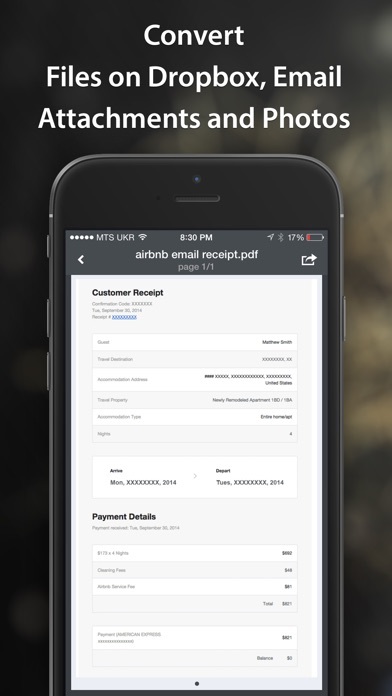 This app converts docs quickly. Love that! Minus one star due to difficulty navigating by changing the doc name, filing, deleting etc. This is a great app. Easy to use and works very well to create useable .pdf copies of almost anything. Can’t always convert large documents and many pages but hey, it’s free and how often do I need one of those. I love it. Best app for pdf conversion and also for any kind of important document storage. I don’t know if other cloud options exist (GDrive) and cant find out since the settings page will not scroll to see all settings. I generally love This companies apps, but to start out on that foot is just disconcerting. I couldn’t live without this app. Virtually no problems with it. This app is excellent at all manner of document conversion to PDF format including web pages for archival purposes. keep up the good work. This is a seriously easy and accurate converter for web pages, photos, contacts, email, spreadsheets and most anything you can select. I’ve tried a bunch of tools and I am sold on Readdle PDF products! Highly recommended. I’ve used Readdle products for several years, and love each one of them! (If you haven’t tried the email system, Spark, you’re in for a treat! PDF Converter is a staple for me, and with PDF Expert I can work freely, making tablet fillable forms. Great for downloading and saving articles on ipad. I am a fifty year old man who is not tech savvy at all. PDF Converter app is so simple to use and extremely fast. Been using it for a few years now and absolutely love it. That’s about it; can’t do much better. I’ve been using this app for a couple of years and I think it works extremely well. Love the way it converts articles on the web to pdfs. I love this companies Apps!!! Being able to convert almost anything into PDFs is an indispensable feature that Apple has half-assed slapped together with the Print PDF to iBooks which is nice but it doesn’t work nearly as well as the Readdle PDF conversion Apps!!!! This app is useless on sites requiring double authentication. It simply prints the login page instead of the document. I gave it 3 stars for printing general website or email. I use this app a lot! It always performs and doesn’t have issues! Seriously, everything this company produces is outstanding. I've purchased them all, so I know. I frequently need to convert articles to PDF and bought this to do so. It worked briefly, but now commonly comes back with a message that the file is too big (on not large files) and to open in the app. When the app is opened a message is returned to ask the developer to upgrade for compatibility with iOS 11. This is the best app for saving files and information. It’s quick and easy. I’m not a guru when it comes to these apps, but for me it’s simple and quick to put what I want into a PDF and it’s there when I need it. Highly recommend!! I would rate it five stars if there was a feature to select many pictures and convert them to PDF at once. It does nothing it says it does. I would like my money back it’s useless. I am a Realtor and on the go!!! This is excellent for me. I really love and use most of the apps by regardless, but this is one of my favorites. The way I use it the most is when I want to copy and save info from a web page. I highlight and copy the portion I want, then convert it in PDF converter, rename and save as a PDF document. It grabs the pictures to, something that is very useful if I'm saving a craft article, recipe, or some other diy web page info. Absolutely love this app. Keep up the good work readdle! If you have the Readdle suite of apps, which I do, this is incredibly useful. If I have photos/ scanned photos I need in PDF form. I just select and 1 second later, viola, there is my file ready to go into PDF Expert where I can mark it up, rearrange or whatever. It works with emails, written text, webpages, clipboard, contacts and just about anything you can imagine. Personally I use Printer Pro generally for the webpages, which is also great for other PDF production. But the sole purpose of this app is to turn just about anything you can imagine into a PDF which is pretty awesome. Very easy to use. Like ability to print from it. Love it. Makes reading web articles easier, and it's especially good for when you don't have time to read them right away. I'm still exploring other uses for it. I'm new at working with this app. If I have more to share, I will update my review. I've given it 5 Stars. Thanks! The App works well all time! It converted documents really good! This app is easily the most useful one of all for users wanting to be able to save and distribute information. It allows users to convert web pages and news and magazine articles to PDF format and save or email them to others right from the app. It also allows users to open the PDF in other apps, including Evernote, making manipulation and retrieval easy. Adobe Acrobat has been my choice for desktop conversion to PDF format for years. I gladly payed Adobe for each upgrade to Acrobat until Adobe chose to offer it as a subscription service as Acrobat DC. Then, in past months, Adobe announced it would no longer provide support for Acrobat XI. My time online now is dominated by Apple iPad and iPhone. I found a bundle of apps by Readdle that would cover my needs: PDF Expert, PDF Converter, Scanner Pro, and Printer Pro. Except for PDF Converter, the remaining apps have worked very well. PDF Converter is the one app out of the bundle that has failed repeatedly. It is also the one app I use constantly. When PDF Converter encounters a file too large to convert, it will notify the user to open the file to be saved directly in PDF Converter. When selected PDF Converter opens to its “Clipboard” where it is displayed with a choice to “Convert.” This process worked. Somewhere between app updates and iOS updates, the “Convert” selection would cause the app to “crash.” In many cases, the file had been converted to PDF. PDF Converter would then need to be restarted to view the PDF. Seamless conversion to PDF and then returning to the app from which it initiated was no longer available. The support for PDF Converter was there and tried to be helpful, to no avail. Many iterations of the crash occurs presently. It sometimes works as designed, but more often it “crashes” to the iPad icon screen without the file conversion. I’ve found work arounds that require lengthy diversions in time to get an article into PDF format for saving in PDF Expert. I don’t think READDLE is fully responsible for app “crashes.” Apple and iOS have a share, however, to what extent, I am not fully aware. READDLE support last left me hanging by saying, “the problem will be forwarded to the developers.” I would be notified if any additional information became available. Weeks out of contact have not produced any further assistance or understanding. READDLE’s PDF Converter is a “5-star” app when it works, but every attempt to use it, is a trip into the unknown. READDLE apps and bundles are paid apps, but this isn’t about the money. It’s about having an incomplete product suite that provided the best answer to Adobe Acrobat. Works seamlessly with my other apps! The ability to ensure graphics are properly converted is unmatched. (This is made possible by prepending ‘pdf’ to the url in the browser and scrolling screen-by-screen thru the doc in PDFComverter.) Wonderful! This is my “Goto” App for transferring data from the internet to my file structure app on IOS devices. Gracias por esta App ha sido de mucha utilidad para mi. This is an awesome program, can convert web pages to PDFs and also photos from photo album. I use it regularly. All Readdle products are top quality! My mainstay for PDFs is Goodreader. But for conversions I find this app essential. It does two things quickly and with no fuss that to my knowledge no other app does as well (but see below): 1. It converts images to pdfs (so that, among other things, you can incorporate them into presentations. 2. It converts web pages (of the print sort — like Quartz, Medium, and many blogs) into nicely paginated pdfs. The convert to pdf feature in Safari doesn’t — what you get is an enormously long unwieldy one-page document. I’d be ecstatic if PDF Converter could convert these into something better, but from now on I’ll be sending web pages to PDF Converter. NB. There are other apps that are supposed to convert web pages to html (search on “print to pdf”). But the ones I looked at use a subscription model for payment (admittedly with one of them you also get a VPN for your money). For me that’s an automatic dealbreaker. Flawless. Even allows for editing (blurring). Vast majority of webpages seem to be incompatible with this PDF conversion process . You just end up with a blank file. Success rate is only something like 1 in 3 cases. PDF Converter works seamlessly with the other Readdle family of apps and allows handling, editing and transferring text files in a myriad of ways. PDF Converter and it’s sister apps I use on a daily basis to be productive. Bravo Readdle. It can’t work with websites that require that you log in because it can’t hold a cookie confirming that you’re logged in. So, you often do not get any conversion. Use Readdle Documents instead. Readdle Documents is their best app: superb. Nearly all of their other apps are incomplete versions of Documents. Don’t waste your money. If you’re looking for a pdf converter, well, this is one. You have this thing right? Like, but it’s not a pdf. 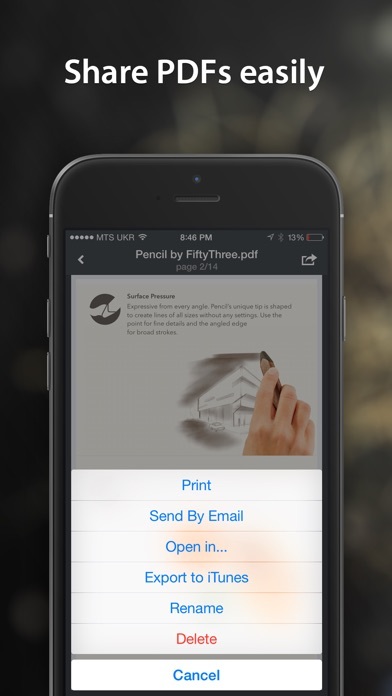 You get this app... and it will turn that thing that isn’t a pdf, into one. I’ve used this for a couple of years, no problems. Now, it gets half way through and just freezes. The apps does at it says, converts different formats to pdf. But for the price it costs, was expecting to merge multiple pictures and convert them to a pdf format. Only converts 1 picture no more. Hopefully on a future update. This app has been very useful in converting web pages (recipes) to pdf without a problem. Very easy to use. Will save u the cost and time of having multiple other apps when this does it all! Works quite well; no bugs yet in over a year of use. Easy to understand and use! I started using this when it was simply recipe clipping, and it is great at that. You can copy virtually any recipe from a web site or other app. But now you can also create meal plans and make your shopping list from the ingredients that you do not have on hand. I also share the shopping list with my husband, and we both add things to the list as we think of them, and then when one of us goes to the grocery, we buy what we both need. It’s great. I also make my own groupings of recipes according to the way i cook. It’s nice to not use someone else’s classifications. Useful, but often hangs immediately after conversion, so it looks as if the article is blank until I close and reopen the app. Have no problems with converting web pages to PDF files for a quick edits and downloads on the go. The app doesn’t excellent job. It works and creates a file quickly and accurately. Perfect way to keep related information together. Best app for pdf conversion and also for any kind of important document storage. But clipboard conversion is not great sometimes. Otherwise it is good. Great app makes my life easy from signing documents to converting pictures to pdf so I can draw on the picture. I combine this app with Documents. This documents app is very simple to use you can free hand draw what you want or use the drawing tools to make it look more professional. There may be better apps out there but I find these app simple to use. I give it two stars because almost two out of five times I try to use it it works, but it is a struggle to get most pages from the internet do ANYTHING but give you garbage, or just crash. It’s a converter and it converts very nicely. It is not to be the one and only PDF tool but it converts just about anything to a portable document format so you can then use the tool of your choice for editing and the like. I have had this app for years and it has been reliable. 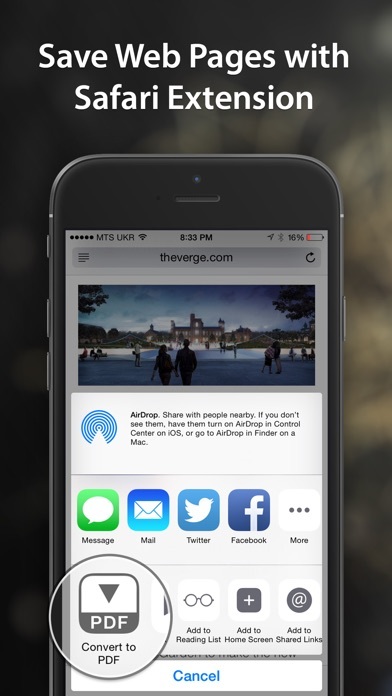 My primary use has been to convert web pages and I like that it is so easy to do without having to open the app. If I then wish to open the document in a different app, I can do that from within the app. It can be frustrating that some web pages that have special formatting may not convert what you want to see, but I don't think that that's this app's fault but is inherent in the web page design. I also like that this has been around a while and looks to stay that way. Too many apps fail after a few years from lack of developer support. Hope they continue to enhance and improve it. Tabs are lost when converting documents (Word, Notes). Without proper formatting, converted document is useless. This is the only application that I have found that successfully convert all my urls into PDF files which I can easily retrieve. Excellent integration with ipad environment and file management. All professionals should have this app. Thumbs up to the developers. Keep it like that. I use it on my iPad. Occasionally an article cause pdf converter to crash. I think that may be due to embedded video. Overall very happy with this app. I previously gave a positive review only to find that the app was not converting many articles I wanted to save from the web. I had better luck using other, very simple, apps. So I reluctantly stopped using PDF Converter by Readdle. Now there's a new update, and I am hopeful that there will be improvements. I am going to update the app soon, and I will then update my review. PREVIOUS REVIEW: I love it. Makes reading web articles easier, and it's especially good for when you don't have time to read them right away. I'm still exploring other uses for it. I'm new at working with this app. If I have more to share, I will update my review. I've given it 5 Stars. Thanks! Love it. Makes reading web articles easier, especially if you don't have time to read them right away. I'm still exploring other uses for it. I'm new at working with this app. If I have more to share, I will update my review. Thanks! It’s surprising that it will convert things on a website that would seem impossible. Very impressive. I’ve been using this app for YEARS! It has done what I purchased it to do, and no more. A number of years ago, the creators actually improved the platform to be even speedier in its conversion. Would like to be able to move documents TO Dropbox rather than just convert Dropbox docs to PDF. That way, I could clean up my docs that I want to archive (to somewhere in addition to iCloud). But otherwise, great app over the years. I’ll be a satisfied user into future as well. I use the app a lot in work and it works like a charm. My only issue with the is that I haven’t figured out a way to do multiple pages at once. I saw the page 1/1 at the top. It is very useful for savingbweb pages. I’ve tried several pdf converter programs. I had two on my iPad when I purchased this one. The others were free and work much better. Paid for it today. Will not work, very buggy, does not make full pdf, crashes, totally broken. Will be asking for money back. I suggest you look elsewhere. Have tried saving payment confirmations, online tickets and, filled in forms. On zero occasions have I ended up with document contents that were correct - just login pages, blank pages, and garbage. I want my money back, you thieves! than my previous app...Love Readdle “Documents,” too. I love this pdf converter! I really like being able to convert information from various sources into one standard format — pdf — and then save it in the Documents app, where I can organize articles/info as I like, and even modify it if necessary. It allows me to have my own private library where I can easily find information I need. A very good investment. I recommend looking for a Readdle package that suits your needs. 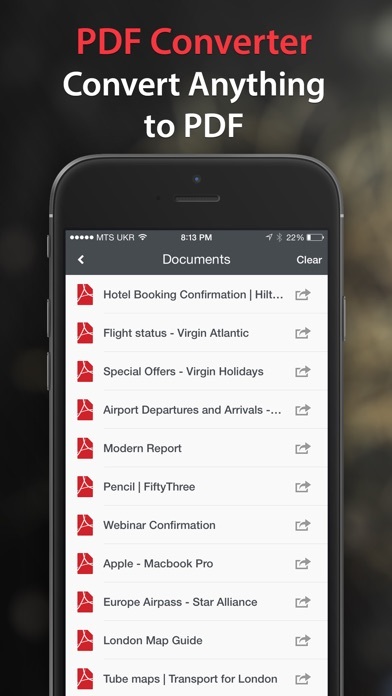 The Documents app has just gotten better through the years! I have been using this app for several years. It is a must have! Highly recommend. I have been an IOS user since the iPad 2 launched and over time have ended up purchasing all of Readdle’s apps. Printer Pro was one of the first allowing me to print to my iPad over my LAN. Documents, convert PDF, PDF and more followed. Although I do not prefer Spark as my main email application, I still, to this day, use Readdle’s apps as my main avenue for getting things done. High quality! Love how the developers over the years keeps Apps connected, updated and stable. Most used App on my Ipad ( doing Web Research) . 5 thumbs up !!!!! Consistently available and just what is needed. Makes so many docs available when otherwise not usable. Thank You! This app makes my iPad functional in place of my laptop. I couldn’t accomplish my work efficiently without it. I have this on my iPad Pro and love it. I am not a heavy user of PDF files but when I need them this works perfectly. The Readdle suite just works for me, it's exactly what I need to effectively and efficiently manage my "paperless-work" on my iOS devices. I have been using this App for years. Has always been great! This is super handy for converting photos and screenshots to documents and being able to save the result with a file name. When website articles don’t agree with mainstream media, they suddenly “disappear”. So I use PDF Converter to capture Internet site articles I want to save. It saves the file names with dates, making it simple to find them again. It is an easy App to use and great research tool! When I purchased this app over a year ago, it worked perfectly. However, it is now unable to convert articles from The Wall Street Journal and the New York Times, which limits its usefulness severely for me. If you need to convert articles from these two publications, don’t buy this app. There may be other online publications or websites on which this app doesn’t work, so beware! This is more than just a PDF app it’s Dream filter organizer that can connect folderS from the Cloud, GDrive, and Drop Box. Readdle is a great co! Limited functionality, routinely fails. Not anywhere close to this publisher’s other apps. I am using this to convert web pages with flight data and it come up as a 1/4 size of the PDF, the rest blank. Scaling is not sensing the width of the web page as displayed. This is a “Must Have” app if you rely on your iPad and Adobe Acrobat DC. Love it! This PDF converter is a powerful tool to be used in every kind of situations that involved the conversion of a file to PDF. Is fast and easy to work with, giving you a long kind of options to work with your new PDF file. I highly recommend it. What I like about PDF Converter is that it doesn’t waste my time. Beginning with sign-in. I put in my password and as soon as I type in the last character it opens itself up. No “enter” or anything else that would waste my time. I like that. Most important, it converts documents quickly and efficiently. I can ask for nothing more. For years, this has been my go-to app for quickly converting web pages to pdf format. 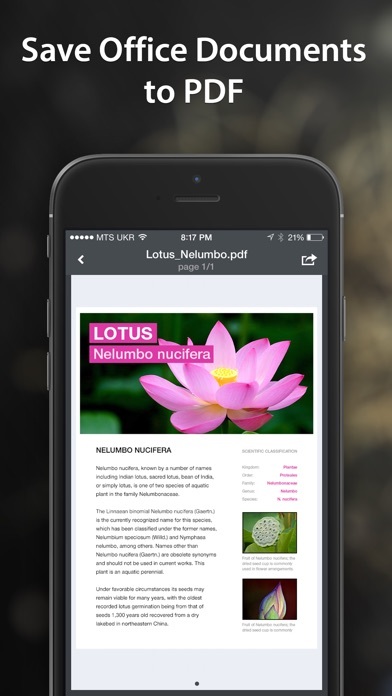 Hint: When files are too large, you can still open and convert to pdf format from within the app. Works 90% of time. By that, I mean that I sometimes have issues with ads concealing part of content. Clicking on the ‘X’ sometimes clears them. Overall, my favorite pdf conversion app. Still impressed with this pdf converter app. It is very streamlined, doesn't require a lot of steps, very simple to use. I use it to transfer articles and craft patterns to my iBooks app. Very handy app!!! Crochet patterns, especially the free ones, are found on blogs, websites for yarn, YouTube videos and any format available from Denmark to Japan or New Jersey. Favorite charity donor patterns Can be shared, edited, & designs Sold faster or filed in your personal Library. Using the PDF converter creates Uniform files compatible w many Software products. I bought the pdf pkg and am very pleased. It’s handy for many business formats and uses as well. Can’t do without it now! This is one of these essential utilities that's needed to convert any file you view into a PDF. After the calculator, this is the second most used utility. After the iOS 11 upgrade, I found out that the native pdf creator forces you to save the programs to Apple Office applications-Pages, Numbers and Keynote. That’s OK if you use them- problematic if you don’t. This app gives the freedom to save it where you want it. I also use their PDF Expert. The ability to SIMPLY edit text on pdfs is really helpful. One of the best Apps ever for converting images, web pages, documents from other apps to a clean PDF with a few little clicks!!!! This app is the usual readdle quality app, that is, absolutely top quality! What I love it for how easy it is to copy, convert and then save online articles or web pages with all illustrations intact. I can then group the saved articles in folders in Documents by readdle for easy access and later reference. Absolutely wonderful app and well worth getting. Exactly what I have been needing. Simple, yet able to meet every need I have in this area. I would give this app a 5 star rating if you could edit and add notes right on the spot. Buy this, there’s so much more you can do when your files are in PDF format. Add PDF expert and it’s even better!! I use this app daily. Does what I need it ti every time. Have used it for years, usually to convert a webpage into a pdf, which I then port over to PDF Expert for next steps, if I plan to work with it. I do a lot of annotating pdfs—even just highlighting with various colors— and occasionally want to edit one. Readdle takes its products seriously, does a good job of improving, usually adding capabilities, or streamlining the user interface. This PDF converter works alright for what it is. It isn’t perfect and outright can’t make a PDF of certain things, or cuts off a PDF if it is a little long. Overall a decent app. I’ve gotten use out of it, just not the kind of use that justifies the cost of the app. This app often fails. I have three other apps that have no problem converting what this app can't convert. Works very well converting documents like web pages to pdf documents and does this job better than iOS’ built-in converter. So, as an Air Force historian, I like to save news articles. They provide launching point for the 120 page histories that I write. But I like best about PDF converter is that you can convert as fast as you need to. I love the speed and the ability to convert webpages to Adobe PDF. The tweaks can come because it shuts down sometimes when you convert. Other times it doesn’t shut down. I think it should be all one way, or all the other way. Personally, I prefer it to shut down because it saves the webpage as a PDF before closes. By shutting down, it takes a step out of the whole process. I haven’t use any of the other functions because I like the primary function of this Application which is to convert everything to PDF. That is what it’s all about, and PDF converter does it well.